Instagram recently launched three (!) 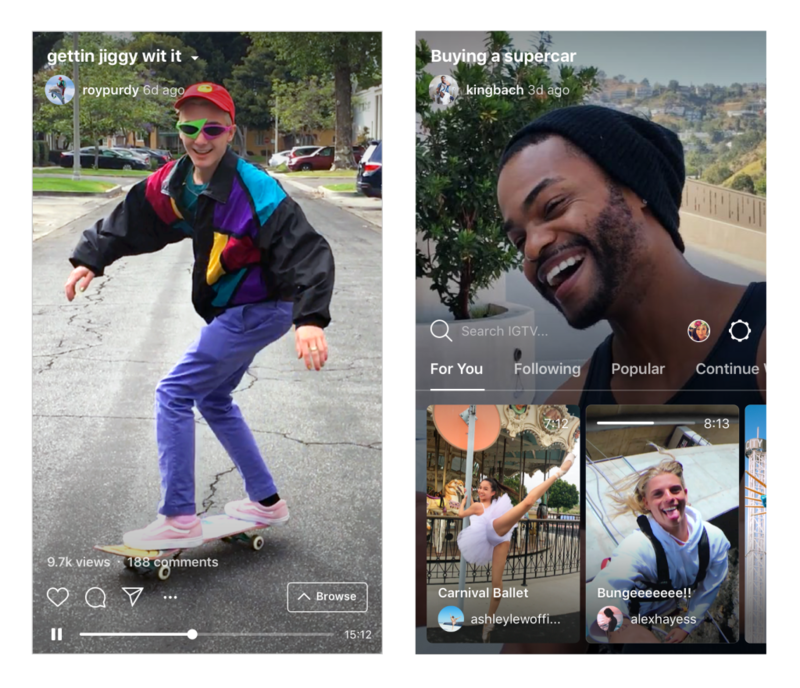 new features for the popular app: Instagram TV (IGTV), Instagram Music, and the questions sticker. These interesting additions to the already thriving social media platform are definitely worth discussing in detail! IGTV: a serious threat for YouTube? IGTV enables users of the app to create videos on Instagram that can last up to an hour. They launched this feature during an event in San Francisco with a very cool introduction by a couple of of the most well known content creators on Instagram. What can you exactly do with IGTV? This new feature has proven that Instagram is ready to take on YouTube for real now. Users don’t have to leave the app anymore to watch videos of their favorite creators. We’ve already seen what the implementation of Instagram Stories did to the daily active user base of Snapchat, so we’re asking ourselves: will the same happen to YouTube? For influencers that haven’t experimented with video content much it’s a major opportunity. It offers a lower threshold, because they don’t have to leave the app they’re familiar with and love so much. It’s also quite ironic that Instagram gave it this name. Television rates are significantly dropping among millennials and the younger generations. This is backed by the fact that the global ad spend on TV is about $190 billion, compared to $220 billion on internet. Instagram however, looked especially at the format of television. They’re considering content creators the channels like on TV, hence IGTV. Next up is Instagram Music, which was also launched last month. This feature enables you to add songs to your Instagram stories. It’s not available in the Netherlands yet, but other countries are already enjoying this new possibility. 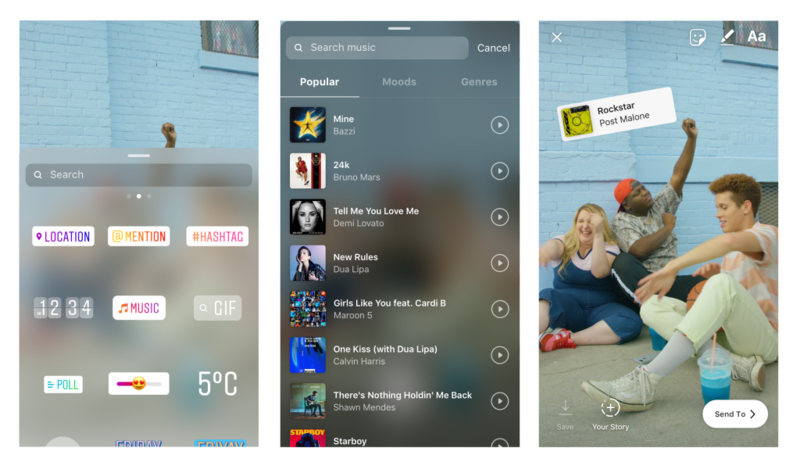 Instagram teamed up with Spotify to implement this new feature, and although we haven’t had the chance to test it out for ourselves we hear great responses from the community. In a press release, Instagram said: ‘’We know that music can play an important role in how you share your moments and express yourself with friends.’’ This feature enhances creative opportunities for influencers and can also bring them closer to their audience. Like Instagram said, music is a way to express yourself, and expressing themselves is what influencers do all day. You might have noticed the overload of the aforementioned the past few days. Literally everybody started posting the questions sticker in their stories. For influencers it is the ideal way to engage more with their followers. What can you do with the questions sticker? This is a major benefit for influencers! We’ve already seen some influencers use a different application to let followers ask them questions about them and their lives, but now that Instagram is offering it, this will increase even more! It’s important for influencers to create a personal connection with their followers to increase engagement. For influencer marketing it’s also an opportunity because influencers can ask actual feedback about a product they promoted for example. This provides valuable qualitative data for brands to improve their strategy. Instagram is stepping up their game with a lot of new features in quite a short time. In terms of influencer marketing Instagram is and always has been the major channel. So we love to see how these new opportunities turn out in practice. We’re ready, how about you? Find out how these new features help your influencer marketing strategy now by requesting a demo below!